New titles extend popular children's series. 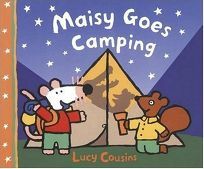 The inimitable mouse and her friends head to the country and pop a tent in Maisy Goes Camping by Lucy Cousins. After singing songs 'round the campfire, the gang heads for bed. But will they all fit inside the tent?